Amaryllis are beautiful flowers that, if cared for correctly, will bloom year after year. They have a magnificent, exotic appearance and are best known for featuring red or red and white blooms. Although they do come in other colors such as purple, pink and yellow and some varieties are even multicolored. 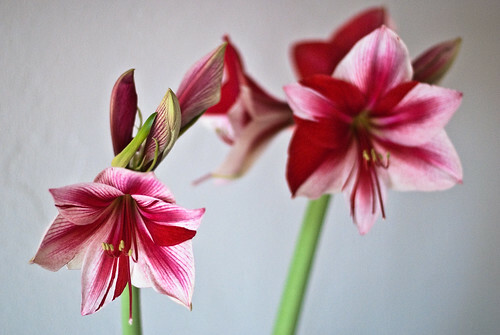 These colorful flowers are grown from bulbs and Amaryllis is the more popular name for what is actually the Hippeastrum bulb. Amaryllis are easy to plant and of all the flowering bulbs, they are the easiest to bring to bloom. While they are ideal for any garden, they also make fantastic houseplants and have become popular gifts at Christmas because of this. So, you have your Amaryllis bulb, now what do you do…? Ideally you will plant it between October and January, they will then flower from winter to spring – generally within six weeks of planting. Amaryllis bulbs are tender and need warmth to grow therefore it is best to plant them in pots – in nutritious compost – and start them indoors, to avoid the frost. The Amaryllis should be grown in a pot only slightly bigger than the bulb itself, with two-thirds of the bulb remaining above the surface. You should begin to water sparingly – then, as the new leaves develop, start watering regularly avoiding excessive watering while not letting the compost dry out. Amaryllis should be placed in full sun – they will grow in light shade but they tend to develop better in brighter light – but remember to turn the pot regularly to avoid the stalk growing towards the light. You should feed your amaryllis bulb every few weeks with a balanced fertilizer and stake larger flowers as they start to grow. Once the flowers on the initial stem have faded, cut the stem back to the bulb and another should grow and flower. So, when can you move Amaryllis into the garden? Firstly, as soon as the plant starts flowering it should be moved to a cooler spot to help extend the flowering period. Then, in the summer, once the last of the frost has passed, it can be moved outside. When choosing where to place it in the garden remember that Amaryllis should not be in intense sunlight, instead look for a semi-shaded position. Once outside you need to be aware of and on the look out for slugs and snails! Similarly, if you find that your plant is flowering this could be down to growing in conditions that are too shady, or under-watering during the previous summer. But, this could also be due to attack from fungal disease or bulb pests. You may be tempted to start pruning but you don’t need to do this until the leaves turn yellow (around late September) – then you can cut them back to around two inches from the top of the bulb. Your Amaryllis will need re-potting every two to three years in January to March – after flowering. Amaryllis will be a great addition to any garden and if you care for them properly, you will be able to enjoy their pretty, colorful flowers for months and years to come. Medinilla magnifica (Buy seeds online) is a tropical evergreen shrub known for its attractive and unusual flowers. The pendulous flowers grow in clusters surrounded by beautiful pink bracts making it a nice outdoor as well as indoor plant. Broad, shiny green leaves retain ornamental value of the plant when it is not blooming. Medinilla magnifica (Buy seeds online) comes from tropical regions of the Philippine where it prefers warm and humid climate. The same conditions should be provided to this lovely bloomer when growing in your garden. As a general rules, grow it in a well-drained and rich soil. You can use any orchid mix to grow your plant. Water it regularly during spring and summer and reduce it to minimum during winter. If you are growing it in colder climates, move your plant indoors where it receives bright sunlight. Mist leaves occasionally. Flowers appear in spring and last throughout the summer season. 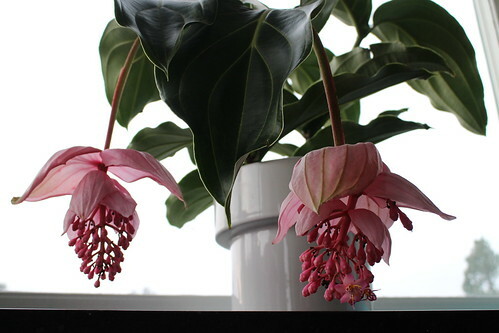 Flowers of Medinilla magnifica are small are grow in drooping clusters covered with large pink bracts. 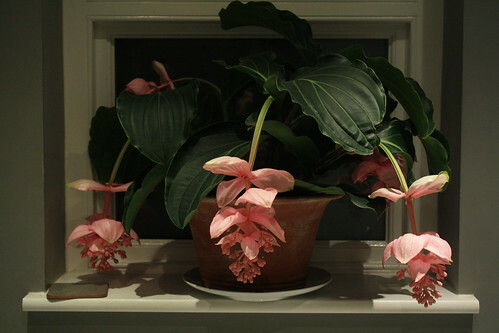 Medinilla magnifica can grow up to 3 or 4 meters however you can contain its growth by keeping it in smaller pots, if required. You can also prune it back after each flowering season. Propagation is usually done from cuttings. The plant is also known as Pink Lantern, Chandelier Tree or the Philippine Orchid. Lagurus ovatus or Bunny Tails Grass is a lovely ornamental grass known for its puffy white flowers that resemble a bunny’s tail. This beautiful annual grass can be grown along garden borders or pathways, as an accent plant in the garden or an ornamental grass in xeriscapes. Bunny Tails grows as a compact ornamental grass growing up to 20 inches high and about 1 foot wide. The blades are soft and about 1.5 foot in length. The ornamental value of this lovely grass is because of its fluffy, white oval flowers that start appearing in early summer. Bunny tails flowers assume tan color as they enter the fall season arrives. The flowers start to dry out at this time. You can keep them on the grass for winter interest. Stalks with dried fluffy flowers can also be removed and used in dry flower arrangement. 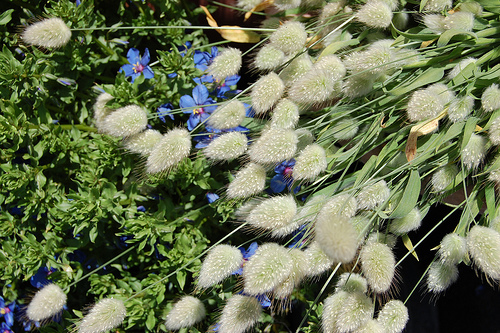 Bunny Tails can be propagated from seeds (Buy Seeds Online) collected from dried flowers. Seeds can be sown in spring. Plants grown from seeds take 1 to 2 year to attain the maximum size. 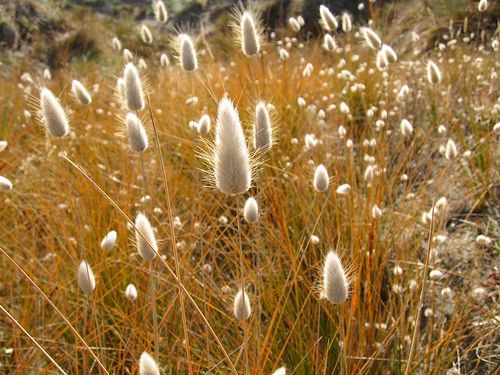 Bunny Tails grass comes from Mediterranean climates where it thrives in a rather dry climate. When grown in gardens or landscapes, provide it sunny exposure and water moderately. Bunny Tails prefers sandy soil that does not retain water. It is a drought-tolerant grass. Water it thoroughly in summer and then allow the soil to completely dry before watering next. When temperature falls, water sparsely. Colocasia also known as Elephant Ears Plant are attractive foliage plants that add a lot of character to a garden landscape. Their bold foliage also makes them excellent indoor foliage plants. If you are looking for nice foliage, rich colors and a low-maintenance plant for your garden landscape or indoor décor, Colocasia should be on top of your list. Colocasia or Elephant Ears Plant (Buy Colocasia online) produces prominently large heat-shapes foliage. The attractive large leaves grow on a 2 to 3 feet long stalk. Different varieties Elephant Ears Plant offers colorful foliage that varies from green to dark purple. Some varieties produce green leaves with prominent white variegation. 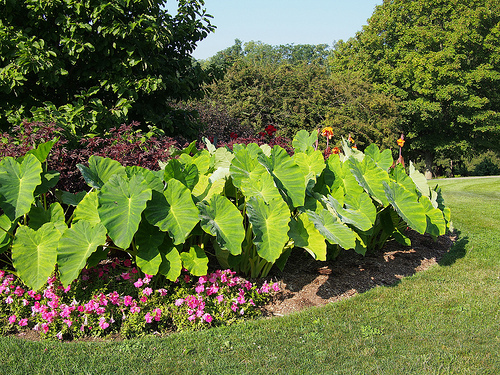 Elephant Ears plant can grow from 3 to 5 feet and it does not take it much time to attain this size. In fact, Elephant Ears is a rather fast growing plant. When grown under right conditions, a plant from tuber can easily grow up to 3 feet in a year. Colocasia or Elephant Ears Plant is grown from tubers. Weather grown in the ground or container, provide them with moist, rich and slightly acidic soil. When grow indoors, make sure that they are placed near a window where it receives bright sunlight. Because of the large size of its foliage, plants grown indoors should be provided with sufficient room to grow. Elephant Ears plants grown indoors also require higher level of humidity. Colocasia can be easily grown in poolside gardens where they provide nice foliage and lush colors to the landscape. When grown outdoors, Elephant Ears Plant should be placed in a spot where it gets plenty of sun in the morning and partial shade for the rest of the day. Plants under partial shade usually grow large foliage than those placed under sun during most part of the day. Colocasia / Elephant Ears Plant should be protected from strong winds, frost or freezing winter temperatures. If you are living in a colder climates, move your plants indoors or trim the foliage completely and tubers for the next season. Colocasia ‘Black Magic’, a 3-5 foot specimen with dark burgundy-black leaves. C. ‘Black Stem’ grows black stems with burgundy-black veins on green foliage. Colocasia ‘Green Giant’ gets its name because of extra ordinary large foliage (up to 5 feet). Colocasia ‘Nancy’s Revenge’ grows up to 5 feet and produces dark green leaves with creamy centers.
) is an evergreen climber from arid regions of Madagascar. It is a drought tolerant and hardy succulent that can survive really high temperatures and long spells of drought. If you are new to the world of houseplants, Xerosicyos danguyi is a nice plant to start with. Xerosicyos danguyi belongs to the family of squash, cucumber, and watermelon and shares many characteristics with its cousins. 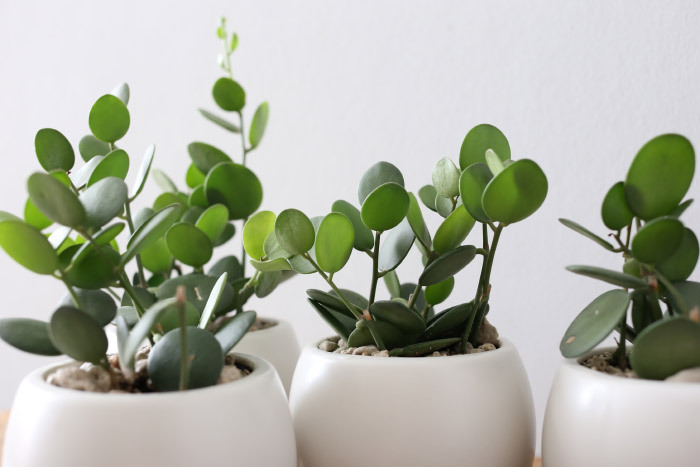 Hobbyists like the Silver Dollar Plant for its round, succulent, and silver-green leaves giving the plant its common name, ‘Silver Dollar Plant’. These unusual round leaves grow along a cylindrical stem that usually grows up to 20 inches. In wild, Xerosicyos danguyi uses its tendrils to hook up with surrounding plants to keep it from falling on the ground. Clusters of tiny flower of pale-green color appear in spring. Xerosicyos danguyi can be easily grown in a well-drained soil and under sunny conditions. Being a drought-tolerant succulent, the Silver Dollar Plant requires only occasional watering. If you are growing it in a pot, water it thoroughly and then allow the soil to dry out completely before the next watering. In colder climates, Silver Dollar Plant can be grown indoors in hanging baskets. Xerosicyos danguyi can be propagated from seeds and cuttings. Plants grown from seeds tend to form caudex on maturity. Aloe ferox is a hardy and attractive succulent known for its lovely flowers and medicinal value of the gel extracted from its leaves. If you are planning to design a xeriscape, Aloe ferox should be on top of your plants list for many reasons. It is a hardy succulent that does not require much care. It produces very attractive flowers of red, orange, yellow-orange and scarlet colors in mid-winter. When grown in groups, spikes of attractive flowers on Aloe ferox add striking colors to the landscape. Aloe ferox originates from rocky and tropical regions of South Africa where it receives marginal rainfall and plenty of sun. When growing it in your garden or xeriscape, you need to imitate the similar climate. 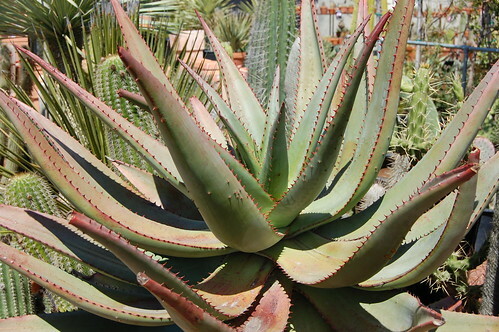 You can plant this hardy Aloe in a spot where it receives good amount of sunlight in a loamy and slightly sandy soil. Aloe ferox does not require frequent watering and should survive long spells of drought. Aloe ferox (Buy seeds online) can grow up to 3 meters though it takes many years to attain this size. The plant produces fleshy leaves of dull green color. The leaves are arranged around the stem to form a rosette. Young leaves have prominent spines along the leaf margins and smaller spines on leaf surface. As the plant matures, older leaves dry up to expose main stem of the plant. The Greek name ‘ferox’ meaning ‘fierce’ is probably because of prominent spines on the leaves. Aloe ferox is also known as Cape Aloe. Aloe ferox produces abundant flowers that attract birds and bees as pollinating agents. 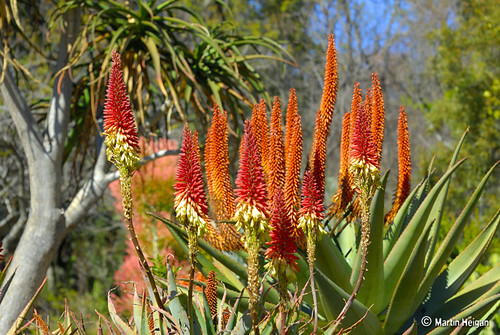 Mid-winter is the time when this lovely Aloe begins to send out orange, scarlet, yellow-orange and red flowers giving the plant its common name, Red Aloe. Aloe ferox is grown commercially for its medicinal value. The gel derived from its succulent leaves is used in cosmetics. The hard, brown excretions obtained from the plan are used for their laxative properties. Aloe ferox can be propagated from seeds (Buy seeds online) that easily germinate when sown in a well-drained but slightly moist soil. Young seedlings should be kept lightly moist until they are 4- 6 cm in size. Cuphea is a genus of evergreen and perennial flowering shrubs. These lovely flowering shrubs are useful for growing in garden borders where they keep blooming almost all through the year. Native to Mexico and tropical regions of Central America, these flowering shrubs produce flowers of green, purple, pink and white. Most species start blooming as soon as winter days are gone and continue to bloom until late summer. Most species of Cuphea require a well-drained soil and indirect sun, and grow up to 1 feet. In colder regions, Cupheas will freeze to ground in winter but will emerge in early spring. Being excellent flowering shrubs, most species are used in garden borders, mixed with seasonal bloomers in a mixed flowering bed or grown as small container plants. Several hybrids and cultivars of Cuphea are easily available at commercial nurseries. Most of them are easily propagated from seeds (buy seeds online). C. ignea: Also known as ‘Cigarette Bush’, Cuphea ignea grows as a small flowering shrub and produces bright red flowers in spring and summer. C. hyssopifolia: Also known as ‘False Heather’, this small flowering shrub produces flowers of varying shades including white, green, pink and purple. C. micropetala is known for its bright summer flowers. The lovely plants featured today is Hypoestes aristata. It belongs to a genus of perennials and evergreen shrubs from tropical regions of Asia and Africa. 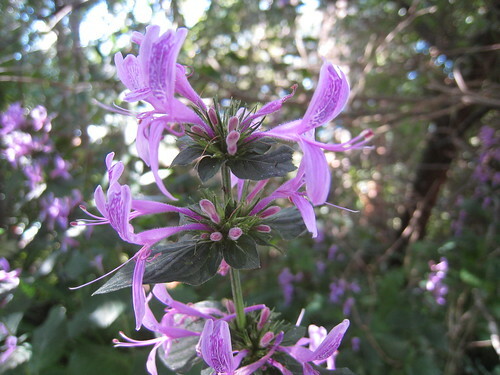 Hypoestes aristata is grown as evergreen flowering shrub that grows up to 5 feet and produces mauve, pink or white flowers. 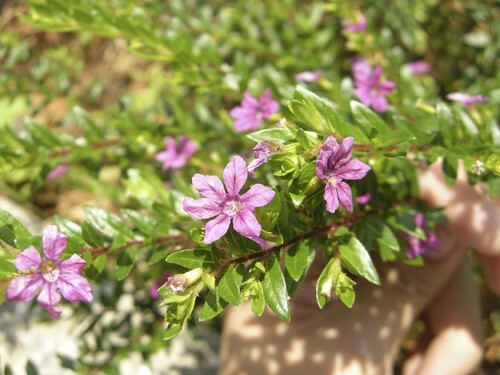 Flowers have ribbon-like petals, which is why the plant is also known as Ribbon Bush. Hypoestes aristata prefers full to partial sun and thrives in tropical climates. In colder climates, it can be grown in greenhouse or as an attractive indoor plant. Hypoestes aristata can be propagated from both seed and cuttings. Seeds can be sown in spring. Soft or hardwood cuttings can be taken in the late winter or early spring. Lotus berthelotii is an evergreen bloomer and is usually used as a ground cover in garden beds and borders or as an attractive hanging plant. The plant is known for its sickle-shaped red flowers with a prominent ‘beak’. The unusual shape of flowers give the plant its common name, Parrot’s Beak. These lovely flowers appear in clusters on trailing stems. The red flowers mature to turn in to orange-red blooms. Lotus berthelotii is characterized by soft needle-like foliage that varies in color from light green to blue-green and silver. The bright flowers of Lotus berthelotii nicely contrast with the foliage and give a rich and delicate look to the plant. Long, trailing stems of Lotus berthelotii make it a nice plant for hanging baskets. The trailing stems can grow up to 10 inches. Prune stems ends to encourage branching. Lotus berthelotii is usually grown from stem cuttings or seeds though the plants grown from seeds take some time to start blooming. Lotus berthelotii prefers a well-drained soil and partially sunny spot in summer. When grown indoors, place it near a sun-lit window where the plant gets 6 to 8 hours of direct or indirect light. 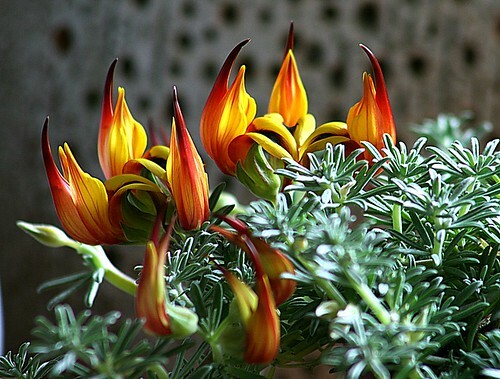 When grown outdoors, Lotus berthelotii should be protected from cold winter by moving it to a greenhouse. If you are looking for something new to try for your summer garden, consider Agapanthus. 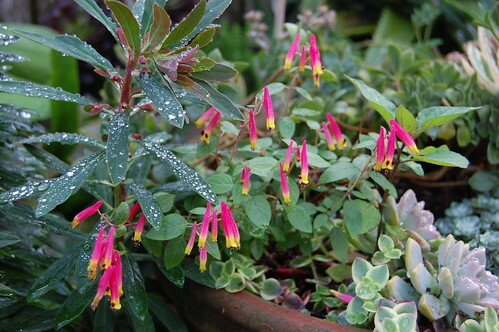 Weather grown as a pot plant or grouped in a garden border, it looks striking with its ultra bright flowers that outshine most of the common bloomers. 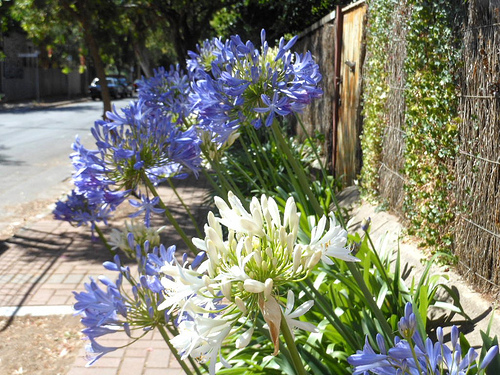 Many varieties and cultivars of Agapanthus that are commercially available can be divided in two grouped: evergreen species that originate from milder climates of South Africa and deciduous Agapanthus that comes from colder regions. Growing condition of all varieties are generally similar – sunny exposure, well-drained soil, moderate watering, and protection from extreme cold. Agapanthus can be propagate easily by division in spring and early summer, or after plants have finished flowering in early autumn. Mature plants tends to divide their bulbous roots; these should be split every three to four years. Agapanthus can also be propagated from seeds however young plant grown from seeds require frequent watering and protection from winter in their first year. Once established, they should be watered only when the soil in dry. Plants grown from seeds take two to three years to flower. Flowers of violet, white, or pink hues appear in summer. 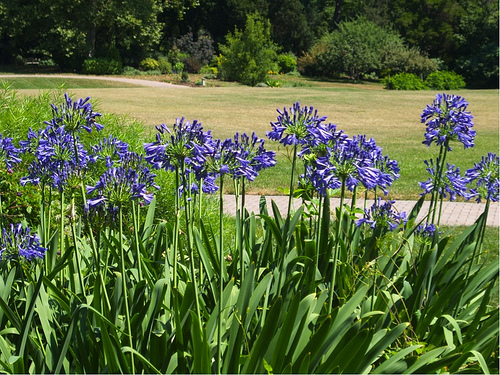 If you growing Agapanthus in the garden, they can be combined easily with other plants in flowering beds. Agapanthus also make nice plants for garden borders. In winter, protect them by mulching with straw and sand. If your soil is water-logged, grow your Agapanthus in large pots and place them in brightly-lit spot where they are protected from frost. Plants grown in pots can be fertilized with a regular fertilizer in spring to encourage flowering. Because the roots system is vigorous, plants grown in pots should be divided every two years. If your plants are reluctant to bloom, move them to a sunnier spot. Among many varieties and cultivars of Agapanthus, some outstanding varieties include: Agapanthus ‘Peter Pan’, ‘Tinkerbell’, ‘Northern Star’, Agapanthus inapertus ‘Midnight Cascade’, and Agapanthus ‘Snowstorm’. Though it is not related to the Lily family, commercially Agapanthus is also known as Africa Lily or Lily of the Nile.